This Cappuccino Glazed Chocolate Mayonnaise Cake is moist and delicious and is the perfect ending of any meal. Some people may think that eating a Mayonnaise Cake may seem weird but if you know what mayonnaise is made of, then you should know that most of these ingredients are already used in cakes. Mayonnaise is a stable emulsion of oil, egg yolk and either vinegar or lemon juice, so it replaces the oil that would typically be used in a cakes. I made it a few days ago when we came to Athens for a short visit and used ingredients which I found at home. I found a leftover opened mayonnaise jar in the fridge and as I had seen mayonnaise cakes on the internet, I google searched for a recipe. I did not hesitate to try the one I found at Hellman’s site. Although I did not have all the ingredients listed, that did not prevent me from improvising and adapting it with what I found. The mayonnaise was not enough, so Greek yoghurt was added to fill in what was missing. (I had the option to add either butter, margarine or olive oil but I preferred to use Greek yoghurt). As there was only 1 cup of crystal sugar, I added confectioners’ sugar as well. I wanted to glaze the cake and looking through the cupboards I couldn’t find anything suitable until I spotted some instant cappuccino, which gave me the idea to use it to make the glaze. I heated the milk, just enough to dissolve the coffee and while it was hot I added some leftover chocolate shavings I found and butter so that they would melt. I then added enough confectioners’ sugar to make a rather runny glaze and finally I flavoured it with raspberry essence, which matches perfectly with chocolate. While the glaze was still warm, when pouring it on top, some of it penetrated through the cake, adding more coffee flavour to the cake. As you will see in the video, I lined the baking tin with parchment paper. I did not cut the paper to fit inside the pan but let it hang outside as well. This was done on purpose, so that the glaze would fall on the parchment paper in order to collect it again and put it back on top. (If you don’t have a spring form pan, just put a piece of parchment paper to cover the platter before putting the cake on top). As the glaze cooled it would stick on the cake and gradually I added it all. At the end I cut the parchment paper on one side and gently removed it from below which left the platter totally clean. The result was amazing! The cake turned out to be incredibly moist and tender. The glaze on top added an extra bonus for those who love coffee and in fact it would make the ideal birthday cake for coffee lovers! Disclosure: I was not compensated nor did I receive any products for this post. Preheat oven to 180oC / 350°F. Line a 23 cm / 9-inch spring form round cake pan with a piece of parchment paper coming out on the sides of the pan. In medium bowl, combine sifted flour, sifted cocoa, sifted confectioners’ sugar, baking soda and baking powder. Mix in salt and vanillin sugar and set aside. In large bowl, with electric hand mixer at high speed, beat eggs and crystal sugar for 5 minutes, until light and fluffy. Beat in Hellmann’s® Mayonnaise and Greek Yoghurt at low speed until blended. Alternately beat in flour mixture with water, beginning and ending with flour mixture. Bake for about 50 minutes or until a knife inserted in center comes out clean. Transfer the cake to a platter leaving the parchment paper on. Put the cappuccino in a bowl, add the hot milk, butter and chocolate shavings and mix until they have melted. Add the raspberry essence and sieved confectioners’ sugar and mix to incorporate. With a spoon add the glaze gradually, adding back the drippings, until all the glaze is added on top. In medium bowl, combine sifted flour, sifted cocoa, sifted confectioners' sugar, baking soda and baking powder. Mix in salt and vanillin sugar and set aside. In large bowl, with electric hand mixer at high speed, beat eggs and crystal sugar for 5 minutes, until light and fluffy. Beat in Hellmann's® Mayonnaise and Greek Yoghurt at low speed until blended. Alternately beat in flour mixture with water, beginning and ending with flour mixture. Nice post. It is very helpful and interesting. I will try it soon. Strange to see a cake made with mayonnaise. Interesting to hear the idea behind why it was used (it all makes sense now haha). Definitely a recipe i will try sometime in the future. Ps. I love how you use videos along with your recipes. They’re really well made! 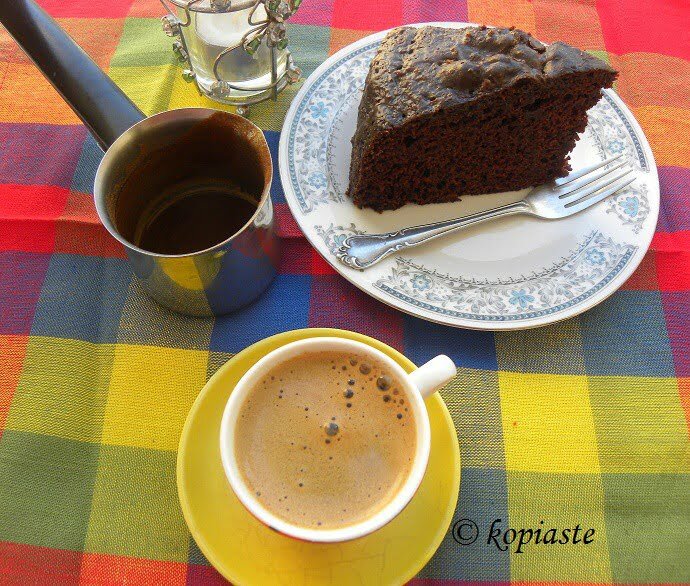 Thanks for sharing this cake’s ingredients and recipe of Cappuccino Glazed Chocolate. I will try to make it myself. I would say Wow!!! The way you explained about the topic was pretty much impressive. I’m always on the lookout for anything coffee related and came across this recipe. The idea of a coffee glaze on a cake is definitely something I’m going to try out. Thanks for sharing!